December 10, 2013. Nick Gates and Graham Bradford arrived in Israel on 17th of November, mentally and physically refreshed after a full 24 hours on the road travelling from Nagpur, India after a wonderfully successful and enjoyable programme with Slum Soccer. Perhaps ‘fully refreshed’ may be a slight exaggeration on reflection. The trip included three flights, the world’s shortest hotel stay (for respectable reasons) with the chaps checking into the hotel in Mumbai at around 2.30 am and taking the early morning alarm call at 4.00 am. Only just enough time for an evening meal, 14 minutes in bed and a full Indian breakfast. Destination Tel Aviv was achieved eventually and in zombie-like condition we were met by the delightful Keren Levi, international Development Manager at Mifalot, our partner organisation for the 5 days ahead. Mifalot is a Beyond Sport Winner and Street Football World member. Keren had the dubious pleasure of being our driver, guide, bodyguard, interpreter, historian, X-factor correspondent and theological punching-bag for our time in Israel. She was exceptionally welcoming, helpful, patient, and skilled in most of these roles. We wish her lots of luck in her driving test – which she should be ready for sometime next summer. The setting for our stay on Tel Aviv beachfront was in some contrast to our Indian experience, but it was noted that there was a disappointing absence of sacred cows and tuk-tuks in the street. We just about coped though. 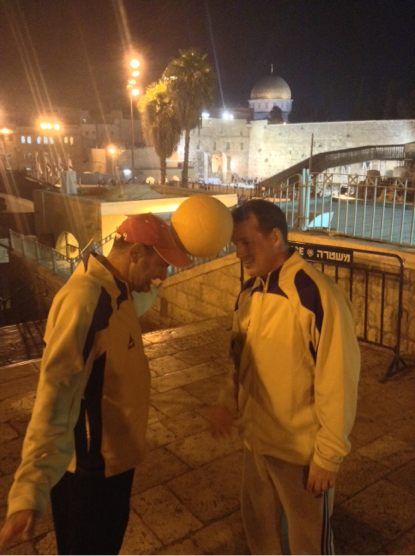 The purpose of the week was a departure from a typical program, with Mifalot senior manager Clive Lessem seeking to learn from Nick how Coaches Across Continents’ coaching, business and logistics model operates so successfully around the globe, as Mifalot looks to spread their work beyond Israel. 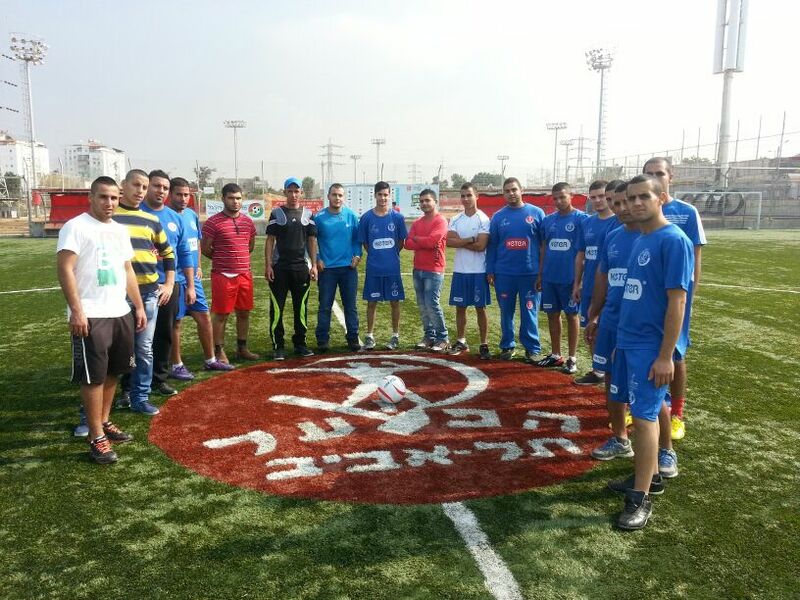 Mifalot is a well-established secular social development organization, affiliated and funded by Hapoel Tel Aviv FC. 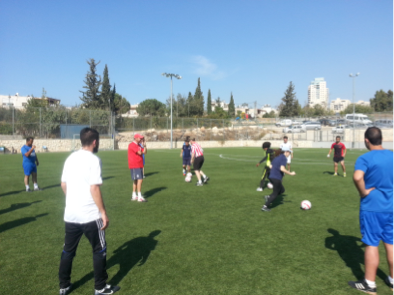 It works across a wide spectrum of communities in Israel, using sport for social development across ethnic, economic, gender, special needs and of course religious divides – of which Israel has a few. 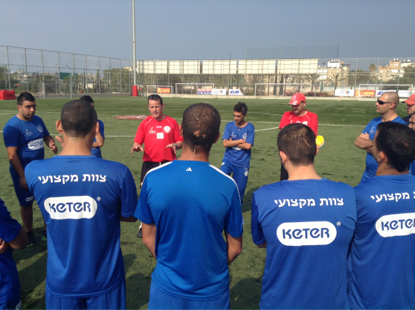 Mifalot works across Israel and Nick and Graham led or observed sessions with a number Mifalot’s regional teams of full-time and volunteer coaches across the country. 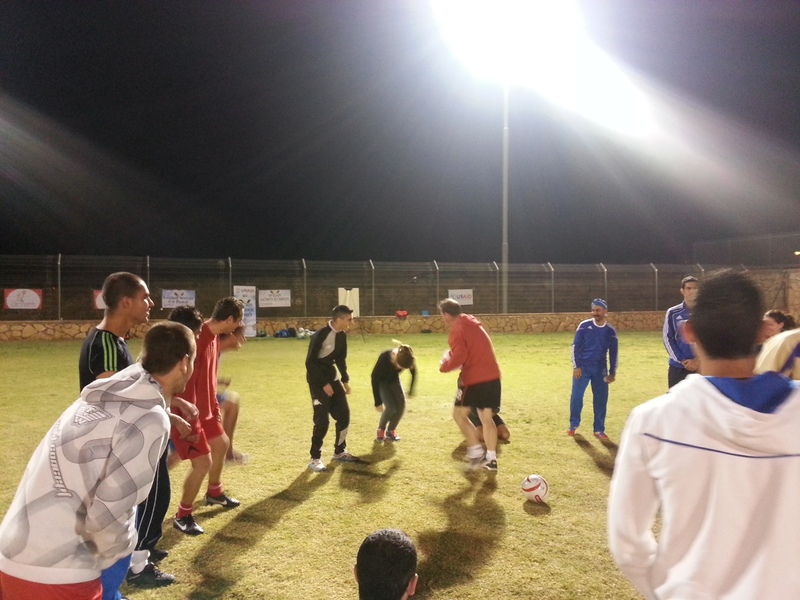 A well-developed national programme of volunteers known as ‘civil service’ provides a healthy supply of coaches to support the core team of full-time staff and Nick and Graham took lively sessions in the north, south and west of Israel, including a highly significant session in the West Bank. In our nation-wide tour of duty we ran coaching sessions for mixed groups of Jewish, Bedouin, Cicassia and Christian coaches in. It was clear that the West Bank session was going to be special. To Nick and Graham there was a significant level of concern that this might be our last ever coaching session together, whilst there was a certain air of excitement and anticipation within Mifalot’s team of full-time staff and coaches who had worked hard to facilitate it. The setting was to the west of Jerusalem, the playing field – perhaps surprisingly – was exceptional (and the call to prayer from the minaret immediately adjacent to the field particularly deafening) and the participants a mix of volunteer coaches from the Arabic, Jewish and Bedouin communities, including women – which in the context of the West Bank was a highly significant. From our point of view the session was not particularly exceptional… it was great fun, there was lots of laughing, noise, enthusiasm and healthy debate – the usual Coaches Across Continents fare. However, for our hosts the coming together of men and women from these communities was hugely significant, and congratulations should go to Seigi and his local coaching team for all the work it must have taken to bring these together on the field, in learning, laughing and friendship. Historic as the program may have been, there were other highlights which Nick and Graham will take with them from Israel. These include the food, the food and the food. Wow. Quantity and quality is perhaps a rare combination on a Coaches Across Continents Program, but was surely the case here. Of particular note was the restaurateur in Um El-Fahem who produced a fantastic array of around ten dishes of various salads, humus and flatbreads before four of us, which Nick and Graham hadn’t realized were merely starters, before bringing to the table superb Arabic meat dishes. We couldn’t praise his food enough, but he was devastated we couldn’t eat it all! But we knew we were in the land of milk and honey when at breakfast our hotel included the option of trifle, tuna salad and porridge….. Well it would have been rude not to! Thanks again to Clive, Keren and their great team of coaches for exceptional hospitality and the opening up of a great future working relationship with CAC. Next: Congratulations to ISF on their new campus! !